The easy, painless way for us to go over to the center of town is to take the number 10 metro from Emile Zola to the east. If we exit at Maubert Mutualite, we are in the 5th arrondisment, close to Notre Dame and the Seine. The Michelin guide says that the place where we exit the metro, at the Place Maubert, has been "since the early Middle Ages" a "traditional rallying point for university students; barricades have gone up here in times of popular uprising." It is an easy walk from this metro station, located on the fashionable and noisy Blvd. Saint Germain, up a tiny street called rue de Bievre to the Seine. 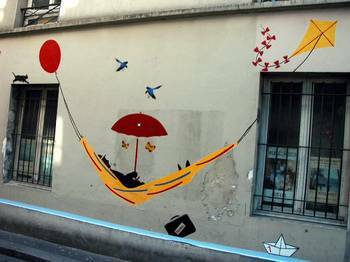 This mural is on the side of a building on the rue de Bievre, near the Quai de la Tournelle on the Seine. This is one of my favorite Paris sensations: one moment, to be in the roar of traffic on a terribly busy and frenetic boulevard, full of Parisians and tourists, and the next moment to be on a quiet, narrow medieval street, almost too small for cars, where we can amble in near solitude up to the Seine, where we are thrown back out into the chaos of activity and traffic noise. The rue de Bievre has some cute galleries and shops. 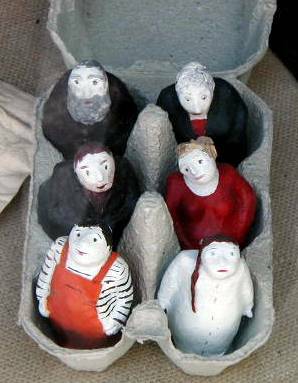 These paper mache egg people are the creations of a woman who has a shop on this narrow passage. The Michelin guide says this street takes its name from a tributary of the Seine. We went up the Quai de la Tournelle to the Quai de Montebello so that I could pick up a copy of FUSAC in front of the Shakespeare & Co. bookstore. 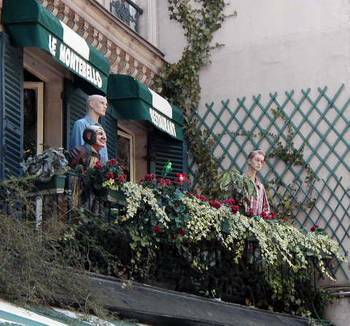 On the way, we noticed this balcony with mannequins over a brasserie. Making our way back along the Seine, past the row of booksellers, we walked down from the Quai to the river. Mid-way down the steps, I noticed this good view of Notre Dame. Crossing over the Seine on the Pont de l'Archeveche, we went behind the Cathedral. On our left was the garden at Square Jean XXIII, and on our right was the Square de l'Ile de France - until 1910, the site of the city's principal morgue. Now it contains the Memorial de la Deportation, a crypt containing the remains of unknown deportees who suffered in Nazi camps. 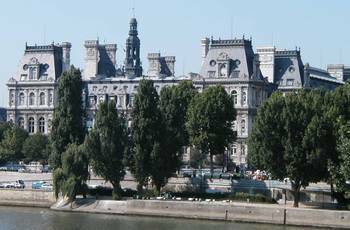 After crossing the Pont St. Louis, we wandered for a little while on the Ile Saint Louis, then crossed over the Pont Marie to the right bank. We noted the Hotel de Sens, built in the late 15th century, and its formal garden. The mansion was originally for the archbishops of Sens. Later, Queen Margot lived here when she returned from exile. She was Henry IV's first wife. We visited the Eglise St. Paul St. Louis, established in 1580 by the Jesuits. The current church there was built in 1796. 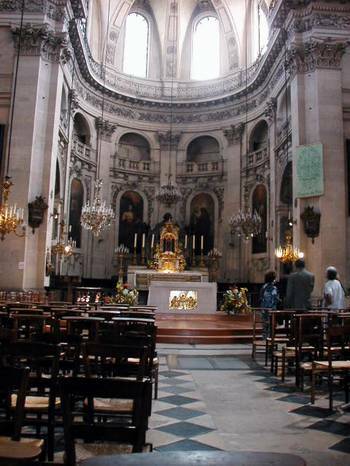 "This well-lit, spacious church with its ornate decoration and sculptures, drew an elegant congregation attracted by musical excellence (directed by Marc-Antoine Charpentier) and eloquent preaching. Many of its rich furnishings were lost at the Revolution. Reliquaries holding the hearts of Louis XIII and Louis XIV were melted down, while the hearts were purchased by the painter Saint-Martin who ground the organs to mix with oil to varnish his paintings. Having used only a small part of Louis XIV's heart, the larger of the two, he gave the remainder to Louis XVIII, who rewarded the painter with a gold tobacco box." 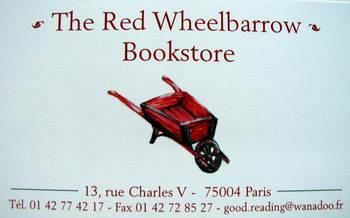 Since we were in the neighborhood, we looked up the bookstore that Kathy G. recommended. The Red Wheelbarrow did indeed have a V.S. Naipal book that Tom needs for his current writing project. Down the street from the Red Wheelbarrow is an American restaurant and grocery called Thanksgiving. 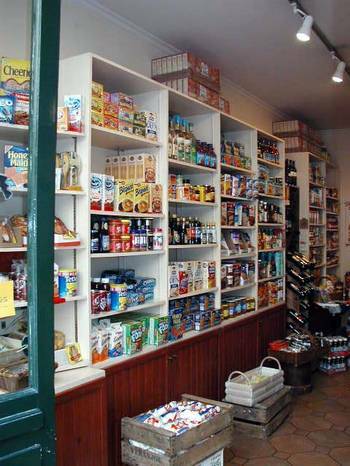 They carry impossible-to-find American items like Hellmann's mayonnaise and Peter Pan peanut butter. 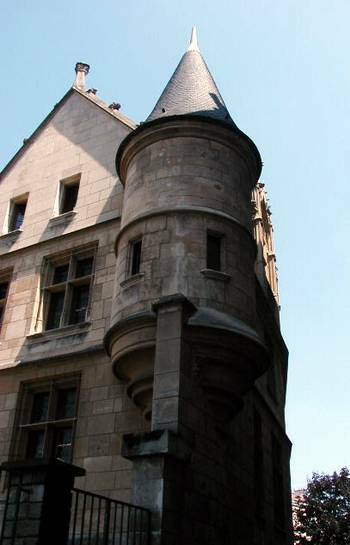 It is located at the corner of rue Saint Paul and rue Charles V.
We visited the Village St. Paul, an ancient and twisted medieval tangle of alleys that is now home to some shops and galleries. It was impossible to capture on film. But I couldn't help but take a photo of this sign for a web site business located in a tiny space in the Village. Note the spelling for "technology." 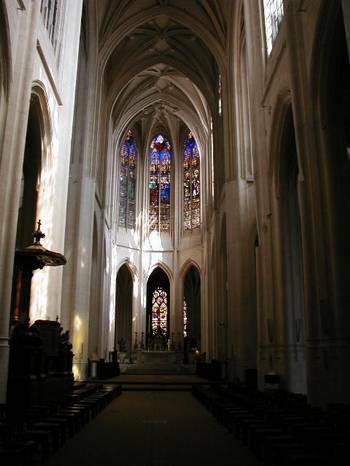 Toward the end of our afternoon, we visited the Eglise St. Gervais St. Protais, very near the Paris Hotel de Ville (city hall). A basilica dedicated to these two saints has been on this site since the 6th century. The current church is basically 16th and 17th century. 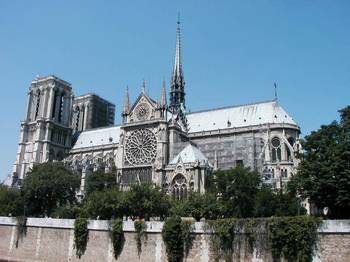 It is home to the oldest organ in Paris. When we left the church, we crossed over a small cobblestoned street called the rue Francois Miron. I was surprised to learn that this was once a Roman highway because it is so small and short. We ended the day with drinks near the Hotel de Ville at the place du Bourg-Tibourg, across from a farmers market at Place Baudoyer. There was much people-watching to be done there. One street over from the place du Bourg-Tibourg is a small passage called "rue des Mauvais Garcons" -- street of the bad boys.